Figure 6. Bivariate plot of axial diameter (log10) against head and body length (log10) across birds and primates. Minimum spanning polygons for nocturnal primates and diurnal primates are added. The nocturnal primates with the longest axial lengths for their body size are tarsiers, which plot with the nocturnal birds represented here; i.e., Strigiformes (owls) Caprimulgidae (nightjars), and Podargidae (frogmouths). Figure 7. Bivariate plot of corneal diameter (log10) against axial diameter (log10) across mammals. Figure 7 plots cornea diameter against axial diameter in extant primates and other mammals. Nocturnal primates, as well as diurnal and cathemeral strepsirrhines, fall with other mammals on a plot of cornea diameter versus axial diameter of the eye (see also Ross, 2000). 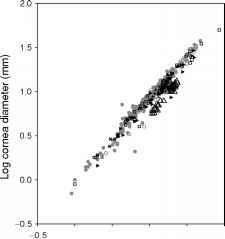 Diurnal anthropoids differ from all other mammals in having small corneas relative to axial length, or longer eyes relative to cornea diameter. The separation between nocturnal and diurnal primates extends to all body sizes sampled. The RMA slopes for nocturnal and diurnal primates are not significantly different, and the intercept for diurnal primates is significantly lower than that for nocturnal primates. Eye shape does not sort nocturnal and diurnal nonprimate mammals. Cornea diameter scales isometrically with axial diameter in diurnal primates, with positive allometry across all diurnal mammals, with negative allometry across nocturnal primates, and with slight negative allometry across all nocturnal mammals. Figure 8. Bivariate plot of corneal diameter (log10) against axial diameter (log10) across birds and primates. isometrically with axial diameter in nocturnal birds, and with slight negative allometry in diurnal birds. The RMA slopes of corneal diameter against axial diameter are not significantly different from each other in diurnal primates, diurnal birds, nocturnal birds, and nocturnal mammals. 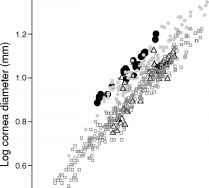 Nocturnal primates have a significantly shallower slope than diurnal primates, and diurnal mammals have a significantly steeper slope than all other groups. Figure 9 diagrams the distributions of cornea and axial diameters in mammals and birds with minimum spanning polygons. There is surprisingly little variability in eye shape across these clades. 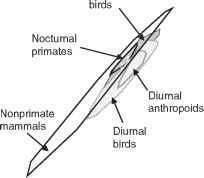 Diurnal anthropoids and diurnal birds have longer axial lengths for their cornea diameters than other birds and mammals, whereas nocturnal birds, nocturnal primates, and diurnal strepsirrhines (asterisks) plot among nonprimate mammals, without regard for their activity pattern. Figure 9. Bivariate plot of corneal diameter (log10) against axial diameter (log10) across birds, nonprimate mammals, and primates. Minimum spanning polygons are illustrated, excluding two outliers for nonprimate mammals. White asterisks on nocturnal primate polygon are diurnal strepsirrhine primates. Figure 10. Bivariate plot of orbital aperture diameter (log10) against axial depth of the orbit (log10) across primates. respect this plot resembles the plot of cornea diameter against axial length of the eye in birds and primates (Figure 7). 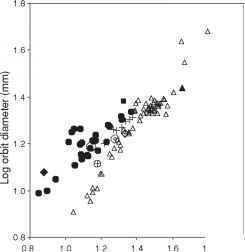 However, the slopes of the two distributions differ, so that at small body sizes nocturnal primates have larger orbital apertures than diurnal primates with the same axial depths, but above an axial depth=1.3 (log10) the nocturnal and diurnal distributions begin to overlap. The activity patterns of several fossil taxa can be reconstructed by plotting them on this distribution. 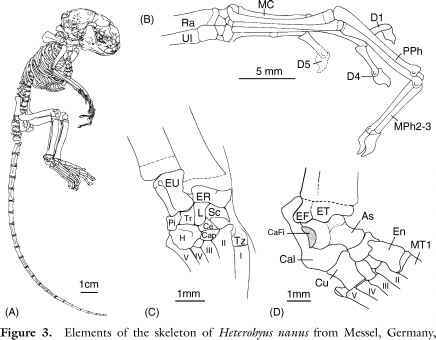 As noted by others, Necrolemur was almost certainly nocturnal. Tremacebus and Homunculus also plot as nocturnal, and Mesopropithecus plots as diurnal. Rooneyia plots closest to the diurnal primates, and was probably diurnal, although it has a slightly larger orbit diameter than extant diurnal primates. At orbit depths greater than that of Mesopropithecus there are no nocturnal extant primates, so it is not possible to estimate the activity patterns of larger fossil forms, such as Hadropithecus. Cantius falls above the distribution of extant nocturnal primates, suggesting that it was nocturnal, confirming the results of Heesy and Ross (2001). However, because of the uncertainty of orbit depth in this taxon, this conclusion must be regarded as preliminary.